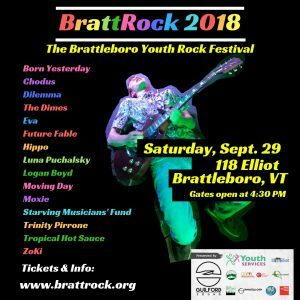 Sixteen youth rock bands and solo music artists from around New England will take the stage at 118 Elliot in downtown Brattleboro, Vermont on Saturday, September 29 for BrattRock 2018, the third annual Brattleboro Youth Rock Festival. Performances will take place on two stages, one indoor and one outdoor, between 5:00 and 10:00 PM. Gates open to the public at 4:30 PM. In addition to six continuous hours of live music, the festival will feature food vendors, arts and crafts activities, and games. All are invited to attend this fun-for-all-ages community event. Advance tickets are available online at www.brattrock.org. Prices are $10 adults /$8 students. A portion of the proceeds from the event will be donated to Youth Services. BrattRock’s organizing committee is proud to present the official 2018 performer line-up. 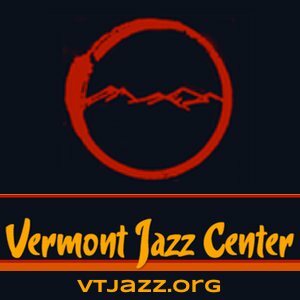 From Vermont: Logan Boyd, Dilemma, Future Fable, Hippo, Moxie, and The Winslow Project; From New Hampshire: Chodus; From Massachusetts: Born Yesterday, Eva Markham, Moving Day, The Starving Musicians Fund, Tropical Hot Sauce, Trinity Pirrone, Luna Pulchalsky, and ZoKi; From Rhode Island: The Dimes. Performer bios and a stage schedule are available on BrattRock’s website. In addition to performing at the festival, area youth musicians will participate in hands-on workshops offered by area music educators Eugene Uman, Samirah Evans, Todd Roach, Molly Steinmark, Wyatt Andrews, Kevin Parry, Peter Siegel, and Peter Solley. BrattRock is made possible by Youth Services, Guilford Sound, the Downtown Brattleboro Alliance, the Vermont Community Foundation, the Vermont Arts Council, the Vermont Jazz Center, WRSI, 118 Elliot, and Hilltop Montessori School, and C&S Wholesale Grocers.